The book Blood on the River by Elisa Carbone is an exciting tale of a young English orphan who is one of the first to travel to the new world. Samuel Collier is a poor boy who has lived in different orphanages and on the streets ever since his mother passed from sickness. He meets a man named Reverend Hunt at an orphanage who decides to take him and two other boys with him to the new world. Each of the boys is to serve under a man on the journey. Samuel is assigned to a man named Captain Smith, a commoner and officer who will soon be the settlers main chance of survival. The journey to the new world is especially hard on Samuel. Getting into fights constantly, Samuel, and cannot seem to befriend the other boys. Eventually, Samuel does manage to befriend one of the boys, but not before the other has died as well as Reverend Hunt who has become one of Samuel’s closest friends and mentors. Samuel now only has Captain Smith who he has learned to respect greatly. He looks up to Captain Smith and thinks of him as a father figure. But Captain smith eventually is injured and leaves with the other boy that Samuel has depended upon as a friend. All Samuel’s friends are now gone but he becomes responsible for a new baby a woman that Samuel knows has given birth to in Jamestown after he saves it and the it’s parents. I was very sceptical when I first started this book because I thought it would be just another attempt to make history less boring. I learned quickly however, that I was sorely mistaken. 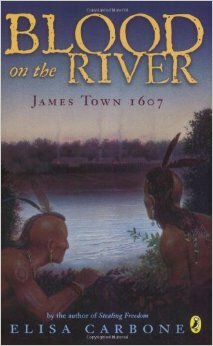 Blood on The River is a great story of the popular Jamestown from a young boy’s point of view. I was intrigued by the book almost instantly and it was actually hard for me to put the book down. This book uses amazing descriptions and easily puts pictures in your head. As I read it, I was almost constantly on the edge of my seat as Elisa Carbone’s way of injecting suspense into her writing is unmatchable. I really enjoyed the fact that the book was from a young boy’s point of view instead of the from one of the leaders or someone like Pocahontas. If I could go back in time I would pick this book again and again because it is in my top five books for sure. I think this book is also great for seventh to ninth grade because it has quite a few words I was unfamiliar with, but given the context clues around it, you can figure it out. 1. Why does Samuel think the locket that he steals is his? 1a. Since it belonged to his mother and was taken after she died and sold in a pawn shop. 2. Which boat does Samuel board and who does he serve? 2a. He is on the Susan Constant under Captain John Smith’s command. 3. Why is Captain John Smith mad that there are more gentlemen than commoners onboard the ship?3a. Since he believes they won’t do any work and expect to have everything done for them. 4. Why is Captain Smith placed under arrest on board the Susan Constant? 4a. Since the gentlemen think he plans to overthrow them and take control. 5. How does Captain Smith communicate with the native americans they encounter? 5a. Through basic words in their language he picked up and hand signals. 6. What was Master Wingfield hiding while everyone was sick and eating terrible food? 6a. He is hiding good food from everyone, like meat, wine and oatmeal. 7.How does Sam try to befreind Richard? 7a. He shows him his sword and armor and what he has learned with it. 8. What do the natives say to the colonists after most of the colonists are dead? 8a. They come and trade with them and tell them which tribes they should fear and to cut the tall grass because that is where the natives hide. 9. Why do Sam and Richard think that the others would all freeze without them? 9a. Since everyone comes to them for embers because they are the best at setting fires. 10. What happened to the party led by Captain Smith that went out to get food? 10a. The passage became too narrow and Captain Smith and the other went on foot, they didn’t come back. 11. How is Captain Smith injured? 11a. He is injured when his gunpowder sack gets lit and explodes. 12. Why does Captain Smith leave and who does he take with him? 12a. He leaves since he was severely injured and he takes Richard with him because he knows Richard can care for him well. 13. What happens to Captain Ratcliffe and his men who go to trade for corn in the winter after Captain Smith leaves? 13a. He and his men are trapped, tortured, and killed by the natives. 14. What severe crime does Samuel commit and why isn’t he punished for it? 14a. He kidnaps Ann’s baby and brings it to the other settlement. He isn’t punished for it because Ann and her husband forgive him because he ended up saving them since the other settlement died off. 15. What does Samuel become when he is a full grown man. 15a. He becomes the leader of a settlement.